In the last post, I ended by saying that developer time is valuable and to be selective about which APIs to work with. This post is going to talk about how to choose an API. Why are you using the API? If you’re building something for educational purposes or for fun, then the last two questions matter less. The questions are more geared towards people who want to build something that will be a good business or a feature that you want the company to add to their app. What would be fun to work on? If I’m into restaurants, Yelp and Foursquare easily come to mind. Does the API solve your problem? API limit what functionality they provide, called endpoints. Let’s say that I want to look at photos for restaurants. Do the Yelp and Foursquare APIs give me photos? They both do. If I was looking for check-in information, Foursquare would have the edge because they were built on the check-in functionality. What are the rules around API usage? In their documentation, API typically have rules around how they can be used. Foursquare’s rules are pretty open and clear on exceptions. I’m not sure if I would be “recreat[ing] the functionality of Yelp’s own website or mobile apps,” with the photo idea, which they say not to do. Foursquare only allows 4 pictures or tips to be shown from any one business. With Yelp’s API, no data can be stored, while Foursquare requires that you refresh the data. How easy is it to use? How well is it documented? Good documentation is super helpful when you’re first starting out. I like that Yelp shows an example of their business response. Clarity around rules is also a must because it reduces hesitation over ambiguity. How does the company treat it’s developers? Do they communicate changes early in advance? Who owns the app that you make? Foursquare seems to remove functionality and gives a few months for developers to adjust. What is the longevity of the platform? Deprecation of API features does make you wonder what they will remove next. How long do you think you can continue to use the API? How long before something else comes along that’s more popular? In my hypothetical example, I have seen that Yelp has better search results though. In the end, I would choose Foursquare because it seems like you are free to do more with it. Flatiron School Week 5- What are APIs and why do they exist? Application programming interfaces (APIs) allow you to talk to the API provider. As iOS programmers, we have interface and implementation files for our objective-c classes. They allow other classes to communicate with our classes’ methods and properties. In fact, we use Apple’s API to build these programs. 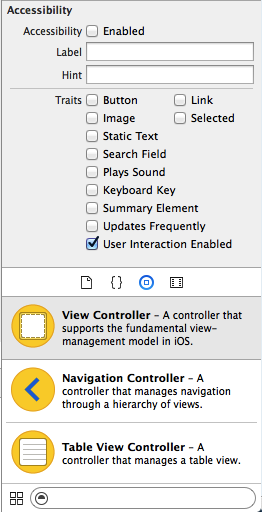 How does a tableViewController actually work? That’s in Apple’s implementation files. We only get to see the interface to be able to use it. This is the same with other companies’ APIs. It seems like everyone has an API now, but why are they valuable? Let’s take Yelp for example. What value does the Yelp API have for an independent developer? provides an easy way to use the company’s location data, so that I don’t have to build my own location service. states what the company allows you to do with their information, so that you don’t get in legal trouble with them. gives you an opportunity to show your developer skills and interest in the company in case you want to work for them. Since there’s no such thing as a free lunch, why are they allowing you access to their API? Yelp wants you to use their service over Foursquare. If your app uses Yelp, then makes Yelp more popular. If Yelp didn’t have a Windows Phone app, then you could built one for that new platform without hiring you to develop for them. If the Yelp app wasn’t as good as it is, then someone else can come in and build it better, but still drive the traffic to Yelp. The company can see what new third party ideas are working well and adjust to what the market wants. They can collect the data that you generate. APIs are good for their internal developers too, so that developers can focus on their area and not have to learn how everything else works. The reality is that you can set up a computer to access their information without an API. For example, aggregators like Mint can be a real pain to banks. Having the API, allows them to better monitor who is accessing their data. APIs make possible crazy cool mashups. Just remember that the API owner wants you to work on their platform because they benefit too. As a developer, your time is valuable, so be selective and intentional about which APIs you work on. Posted on November 3, 2014 November 3, 2014 Categories Questions and AnswersTags APILeave a comment on Flatiron School Week 5- What are APIs and why do they exist? Question: Should I be using frame or constraints to draw views in iOS? Answer: Constraints. Autolayout will be able to adjust to the four different screen sizes, so you don’t have to. It’s like the CSS of iOS. Question: I know how to animate the background color of a UIView from black to red with animateWithDuration … What do I use when I want to make it go from black to blue to red? Answer: I could use two animations with different durations, or key frame animations. Question: One of the labs this week was making a game with four draggable images. After finishing the lab, I noticed that I could drag multiple images at a time and that they would collapse to one location at the end of the drag, because I had only accounted for one object. How can I make it so that the user can only drag one object at a time? Answer: One solution I found online used one gesture recognizer in the superview and detected which object was pressed using hitTest:. However, this did not solve my problem. I could still take the two. This question is still open, but I can imagine a solution where I store the locations of a four objects in an array and update it as I change each object’s location. Question: When I look at Storyboard segues, there’s the word deprecated next to push segues. What does deprecated mean? Answer: Apple will not be phasing out that features soon in the next release. It looks like they’re replaced the push segue with a show segue. Question: Should I be learning to use the storyboard or learning to make views programmatically? Answer: It depends on the usage. Storyboard is great for building views quickly and with little code. I was told that one major drawback is that it’s almost impossible to merge conflicts on storyboards. This means that when another programming changing the same view, one person’s changes will be lost. This can be mitigated by creating xib files for each classes and one owner per class. Storyboard tutorial for iOS 7. Question: What are those A, C and M letters next to file names on the project Navigator in Xcode. Answer: Those are the git version control symbols. A for added. C for conflict. M for modified. More here. Question: Do I make the base initializer(init) or the custom initializer (initWithName:Birthday:Hometown:) make the designated initializer? Answer: Use the custom initializer as the dedicated initializer. For the base initializer, use the dedicated initializer and pass in default values. More here. It saves repeated code and makes there one point of failure. Question: Why should I use _instanceVariable in the init and setter methods instead of self.instanceVariable? I thought that we were supposed to always call methods. Answer: For one, using self.instanceVariable in the setter will get an infinite loop because it will keep calling setInstanceVariable. There is a thing called key value observing (KVO) (awesome tutorial), which notices whenever the setter method is called for a property. In the init method, we don’t always want other people to know that we’re setting the property value.